Background: Okra is a commonly consumed healthy vegetable in many countries due to its wide range of pharmacological effects. The present study was designed to investigate in vivo antidiabetic potential of the total flavone glycoside from okra fruit (TFGO) on type 2 diabetic rats. Materials and Methods: TFGO was obtained by column chromatography on 70% ethanol extract of okra fruit, and high-performance liquid chromatography analysis was carried out on its' three main flavone glycosides. In rats, 2000 mg/kg of TFGO did not show any toxicity on the acute toxicity test. Type 2 diabetic rats were induced by streptozotocin (35 mg/kg; i. p.) after fed with high-fat emulsion for 4 weeks. Rats were divided into six groups: normal control group, diabetic control group, metformin control group (100 mg/kg), and three TFGO groups (100, 200, and 400 mg/kg). The antidiabetic potential of TFGO was measured by comparing body weight, food intake, fasting blood glucose (FBG), oral glucose tolerance test (OGTT), superoxide dismutase (SOD), malonaldehyde, triglycerides (TG), total cholesterol (TC), organ index, and histological section of kidney tissue in rats. Results: The results showed that the administration of TFGO significantly (P < 0.01) decreased the levels of FBG, TG, TC, liver index and increased (P < 0.01) OGTT, SOD levels in diabetic rats compared to diabetic control group rats. Moreover, the lesion of diabetic kidney tissue was recovered obviously. Conclusions: Our findings confirmed that TFGO has significant antidiabetic potential in rats. This study provides a reference point for further investigation and development of TFGO. Abbreviations used: TFGO: Total flavone glycoside from okra fruit; OGTT: Oral glucose tolerance test; SOD: Superoxide dismutase; TG: Triglycerides; TC: Total cholesterol; MDA: Malondialdehyde; FBG: Fasting blood glucose; STZ: Streptozotocin. The total flavone glycoside from okra fruit significantly decreased the levels of FBG, TG, TC, liver index and increased OGTT, SOD levels in diabetic rats. The total flavone glycoside from okra fruit has significant antidiabetic effect. According to the prediction of the WHO, diabetes in the year 2030 will affect the life of 440 million people. If without reasonable and effective treatment, the cardiovascular disease (CVD) caused by diabetes will be the main reason for the high rate of morbidity and mortality., The type 2 diabetes is characterized by continuous high hyperglycemia which basis of pathology, and physiology is the insulin resistance due to the dysfunction of the pancreas islet β cells., Another hand, type 2 diabetes associated some complication such as nephropathy CVD or retinopathy which leads to double the risk of death compared to healthy people. At present, we manage the diabetes through several drug groups by acting on different therapeutic targets, which includes insulin sensitizer (thiazolidinediones and biguanides), insulin secretagogue (meglitinides, inhibitor DPP-4), inhibitor of glucose recapture (glifozine), and antihyperglycemic (acarbose). However, these drugs used to manage diabetes cause some side effects although they can control the blood sugar level. It is reported that many traditional drugs from nature plants were used to manage some diseases with fewer side effects.,, Therefore, seeking out an ideal drug from natural plants to manage diabetes has become one trend of modern medical researching. The okra belongs to the annual herbaceous plants in the mallow family with botanic scientific name of Abelmoschus esculentus (L) Moench. This plant is originated from Eastern Africa and widely distributed in the Middle East, Southeast Asia, and southern part of Europe. It has been cultivated okra for a long time in China. Studies have shown that okra contains many functional components including flavonoid and polysaccharide with some pharmacological effects such as control blood glucose level, antioxidation, enhancing immunity, etc., However, there is no report indicating the relationship between the total flavone glycoside from okra fruit (TFGO) and its management on diabetes. Microplate Reader (M200, SwissTecan), high-performance liquid chromatography (2695 with 2996 PDA diode array detector, America Waterscompany); microscopy (BX20, Japan Olympus). Metformin was purchased from Yunnan Kunming LTD, Kunming, China. Streptozotocin (STZ) was purchased from American Sigma Corporation Ltd. All biochemical markers kits were purchased from Nanjing Jiancheng LTD, Nanjing, China. Purified 5, 7, 3',4'-tetrahydroxy flavonol-3-O-[β-D-rhamnopyranosyl-(1 → 2)]-β-D-glucopyranoside, 5, 7, 3',4'-tetrahydroxy flavonol-3-O-[β-D-glucopyranosyl-(1 → 6)]-β-glucopyranoside, 5, 7, 3',4'-tetrahydroxy-4''-O-methylflavonol-3-O-β-D-glucopyranoside were obtained from our laboratory in previous study, see [Figure 1]. All other chemicals used in this research were of analytical grade and were produced from Yonghua Chemical Technology (Jiangsu) co., Ltd, Changshu, China. Okra was collected from local farm in Hangzhou, Zhejiang Province, China. The plant material was authenticated as A. esculentus L. by Professor Xilin Chen, the plant taxonomy expert of Zhejiang Chinese Medical University. The fruit was separated and dried under shade. At first, 10 kg dry okra fruit was smashed and subjected to successive maceration with quintuple aqueous-ethanol solution (70%, four times for 10 h at room temperature). The concentrated ethanol fraction was subjected to column chromatography over D101 macroporous resin. The eluent with an aqueous-methanol solution (60%) was combined and concentrated to powder in vacuo at 45°C. After dissolved with methanol, the solution was subjected to column chromatography over silica gel, eluting with gradient ethylacetate-methanol. TFGO (27 g) was obtained in ethylacetate-methanol (15:1). The yields of TFGO is 0.27%. Purified 5, 7, 3',4'-tetrahydroxy flavonol-3-O-[β-D-rhamnopyranosyl- (1 → 2)]-β-D-glucopyranoside (HQK-1), 5, 7, 3',4'-tetrahydroxy flavonol-3-O-[β-D-glucopyranosyl-(1 → 6)]-β-glucopyranoside (HQK-2), and 5, 7, 3',4'-tetrahydroxy-4''-O-methylflavonol -3-O-β- D-glucopyranoside (HQK-3) were dissolved into 5 mL methanol, respectively, and obtained three standard solutions (3.16, 0.325, and 0.508 mg/mL). The mixed standard solution was obtained by taking 1 mL standard solution, respectively, into 2 mL methanol. The sample solution was obtained by taking 10.0 mg TFGO into 10.00 mL methanol. The mixed standard solution and sample solution were analyzed by HPLC with the following chromatographic conditions: Sunfire C18 column (5.4 μm, 4.6 mm 0 × 250 mm). The column temperature was set at 28°C and at a flow rate of 0.8 mL/min. The mobile phase includes methanol and 0.1% phosphoric acid solution at a ratio of 47:53 (v/v) all time. Flavone glycoside was determined at 255.6 nm. SD male rats (Production Permit Number: SC2008-3344, 60–80 g) were used to assess hypoglycemic activity and the acute toxicity study. Rats were kept and maintained under standard laboratory condition (temperature [23°C ± 1°C) and humidity (50% ± 5%]) with a 12/12 h light-dark cycle. The animals were fed with standard laboratory diet and allowed to drink water ad libitum. All experimental procedures were conducted under the supervision and approval of the Laboratory Animal Research Center of Zhejiang Chinese Medical University (Number of animal license: SYXK [Zhejiang] 2013–0184). Acute oral toxicity of TFGO was determined as per Organization for Economic Cooperation and Development guideline 423. After the oral administration of TFGO (2000 mg/kg), rats were observed during the first 24 h, particularly giving special attention during the first 4 h, and 14 days regularly observed for the residual toxicity of TFGO. 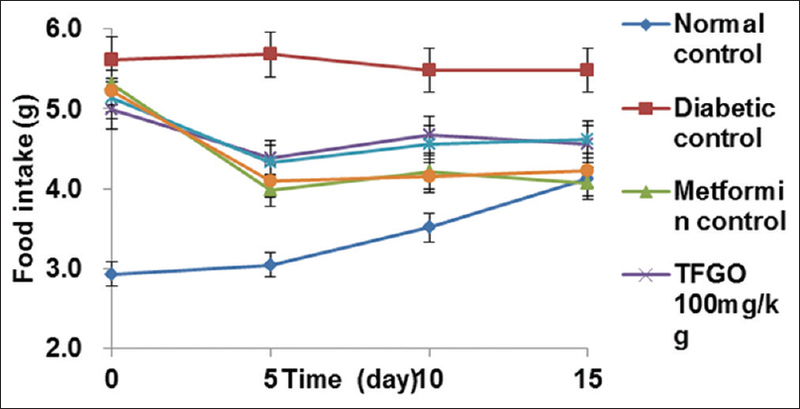 After the acclimatization, diabetes was induced in rats by earlier reported methods with slight modifications., After fed with high-fat emulsion for 4 weeks, the 12 h-fasted rats were treated with a single intraperitoneal (i.p.) injection with freshly prepared STZ (35 mg/kg) dissolved in sodium citrate buffer (pH = 4.5). The high-fat emulsion contains 15% lard oil, 3% cholesterol, 3% yolk power, 1% cholate, 0. 5% propylthiouracil, 2.5% dextrose, 1% Twain 80, and 74% distilled water. Blood samples were taken from the tail vein 48 h after STZ injection to measure glucose levels. Animals were exhibiting blood glucose more than 11.1 mmol/L were selected for further study. Animals were divided into six groups, and each group consisted of 10 rats. The grouping details are: Normal control group and diabetic control group rats were received cold 0.9% w/v NaCl solution (5 mL/kg). Metformin control group rats were received standard drug, metformin (100 mg/kg). Three TFGO groups rats were treated with TFGO 100, 200, and 400 mg/kg, respectively. The cold 0.9% w/v NaCl solution, metformin, and TFGO were administered orally to the respective group rats for 14 days. Meanwhile, weighed the rat at interval of 4 days and recorded their amount of daily water and food intake. Before the first dose-administration and after the end of the 14th day of dose-administration, fasted rats of all groups for 12 h and determined the rat's blood glucose level for the estimation of fasting blood glucose (FBG). The day before sacrificed and oral glucose tolerance test (OGTT) of rats was performed after 12 h fast. After being administered orally with glucose (2000 mg/kg), blood samples were obtained from the tail vein at 0, 30, 60, and 120 min, and measured the blood glucose level by the method of glucose oxidase. After estimating the OGTT, used 10% w/v chloral hydrate solution to anesthetize and carried out the euthanasia. Blood sample was collected through abdominal aorta. Then, separated the serum and kept it at −80°C for the biochemical parameters estimation. Dissecting out the whole abdominal fats, liver and kidney tissue, they were washed immediately with cold 0.9% NaCl solution to remove blood, kept at-80°C for the evaluation of organ index, and morphological changes in kidney tissue. The serum was used to estimate the superoxide dismutase (SOD), malonaldehyde (MDA), triglycerides (TG), and total cholesterol (TC) level by relevant biochemical markers kits. The whole abdominal fats and liver tissue were weighed to measure the abdominal coefficient and liver index. Sections (4 μm) of kidney tissue were counterstained by hematoxylin, dehydrated by absolute ethyl alcohol and xylene, and mounted by Entelan. The morphological changes in kidney tissue were analyzed by microscopy. The data were expressed by the following as the mean value ± the standard deviation. Used the SPSS statistical software (SPSS 19.0 Inc., Chicago, IL, USA) one-way analysis of variance, P < 0.05 is a significant difference and P < 0.01 is the highly significant difference. 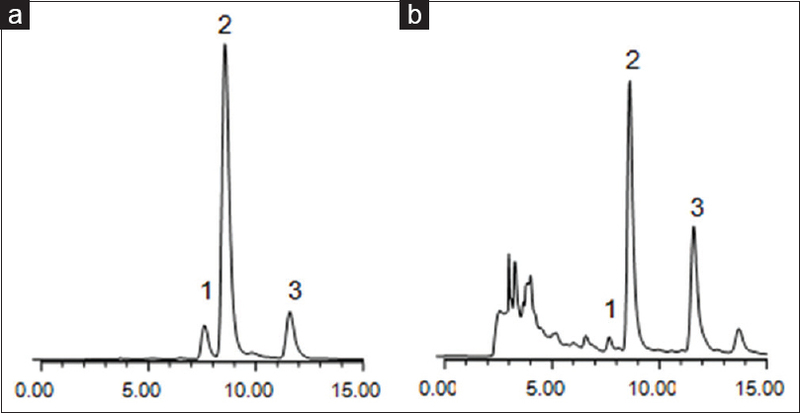 As shown in [Figure 2], under the chromatographic conditions former mentioned, achieved the baseline separation between the chromatographic peaks of adjacent. The content of sample was shown in [Table 1]. The three kinds of flavones glycoside, total content of 73.09%w/w of TFGO, are major elements of TFGO. The oral administration of TFGO (2000 mg/kg) did not show any toxicity signs and mortality during acute toxicity study. Therefore, to investigate the antidiabetic potential of TFGO, the dose of 100, 200, and 400 mg/kg were selected. In [Table 2], the body weight in the TFGO groups, particularly in TFGO 400 mg/kg group (P < 0.01), was significantly increased than those in the diabetic control group in all time we studied. Meanwhile, in [Figure 3], all groups with TFGO at 100, 200, and 400 mg/kg as well as metformin significantly lowered food intake level than those in the diabetic control group (P < 0.05 or P < 0.01). In [Table 2], the body weight in the TFGO groups, particularly in TFGO 400 mg/kg group (P < 0.01), was significantly increased than those in the diabetic control group in all time we studied. Meanwhile, in [Figure 3], all groups with TFGO at 100, 200, and 400 mg/kg as well as metformin significantly lowered food intake level than those in diabetic control group (P < 0.05 or P < 0.01). 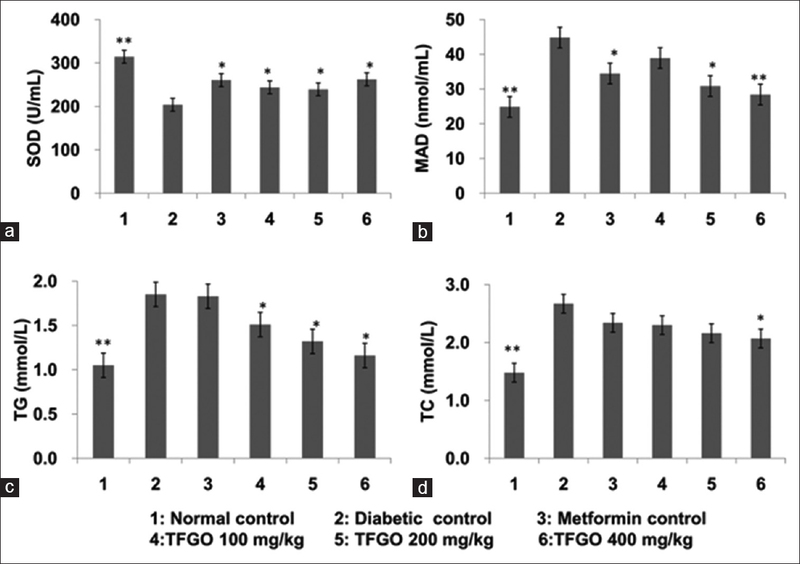 In [Figure 4], a 14-day treatment with the TFGO (particularly 400 mg/kg) and metformin produced a significant (P < 0.05) reduction in the FBG level in diabetic rats. In [Figure 5], after a single oral ingestion of glucose (2000 mg/kg), it is observed that the TFGO (400 mg/kg) induces a significant decreases in the blood glucose level starting at 30 min, and the effect was sustained throughout the 120 min of experimentation with respect to the diabetic control group (P < 0.01). 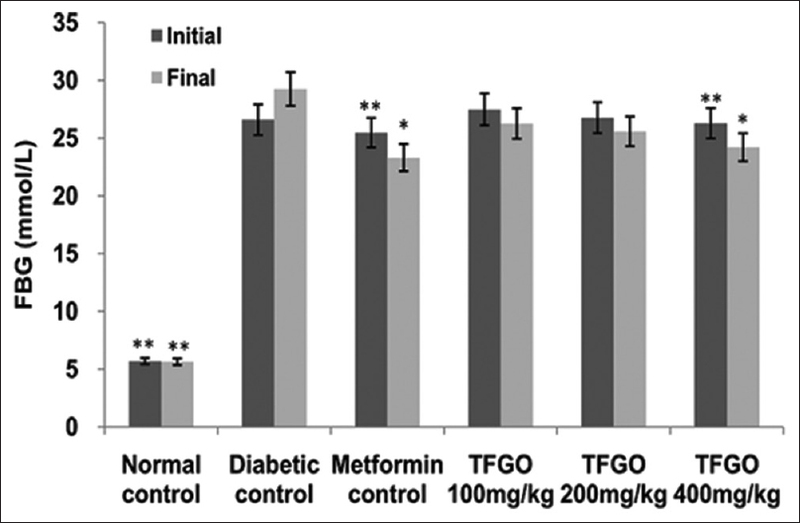 In [Figure 6]a, it is observed that TFGO (100, 200 and 400 mg/kg) as well as metformin induces a significant increase in the SOD level with respect to the diabetic control group (P < 0.05). Meanwhile, in [Figure 6]b,[Figure 6]c,[Figure 6]d, respectively, the MDA, TG, and TC level in the TFGO 400 mg/kg group were significantly decreased than those in diabetic control group (P < 0.05 or P < 0.01). 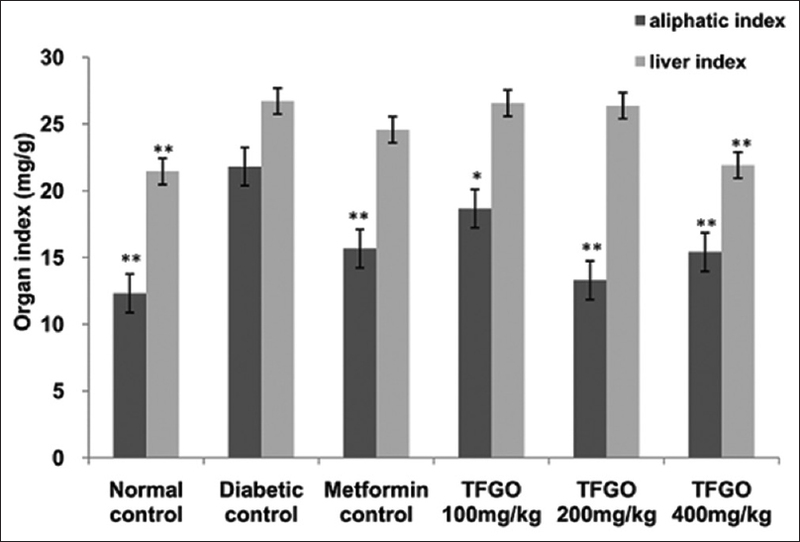 As observed in [Figure 7], the diabetic rats treated with TFGO (100, 200, and 400 mg/kg) significantly decreased aliphatic index than diabetic control (P < 0.01), similar to that of metformin. Meanwhile, the liver index in the TFGO 400 mg/kg group was markedly decreased than those in diabetic control group (P < 0.01). 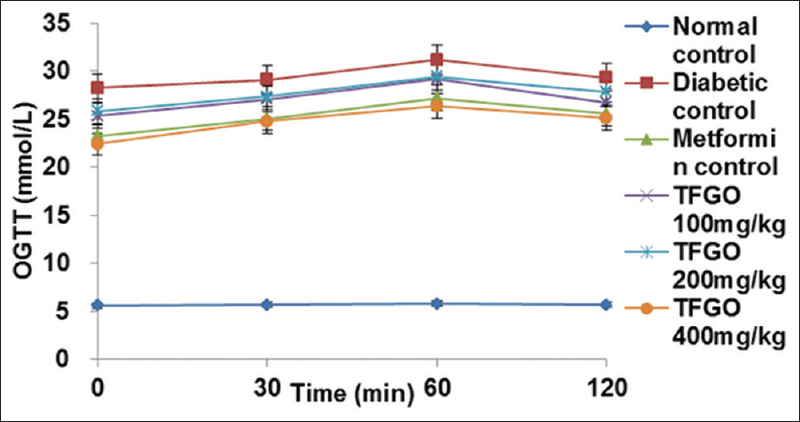 Figure 7: Effect of total flavone glycoside from okra fruit on organ index of diabetic rats. Data were expressed as mean ± standard deviation (n = 10). Note: Compared with the diabetic control group, **P < 0.01; *P < 0.05. The morphological changes in the kidney tissue can be showed directly by the sections of kidney tissue. As [Figure 8] shown, glomerulus' morphology structure is full and clear in the normal control group; the glomerulus present irregular pouch-shaped form with larger volume in the diabetic control group. Compared with the diabetic control group, the glomerulus' volume had a little bit smaller in the TFGO 100 mg/kg group and TFGO 200 mg/kg group. 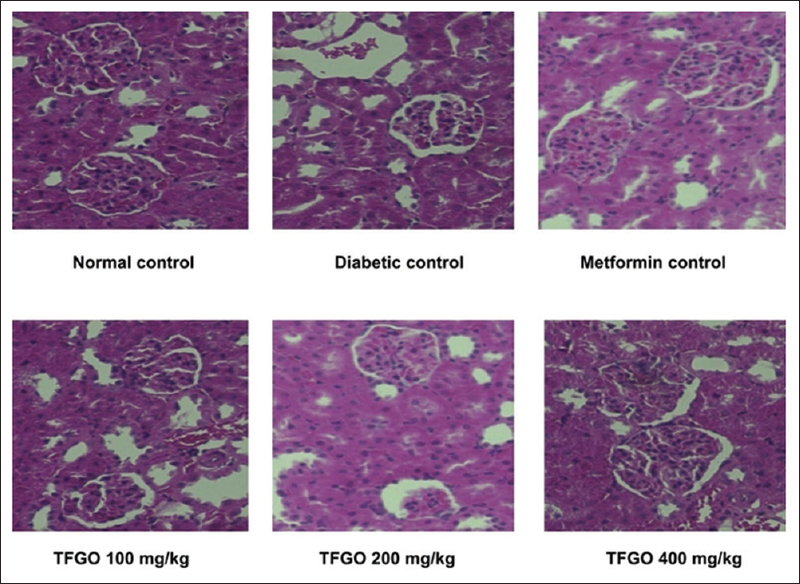 Meanwhile, the morphological changes of kidney tissue have been improved in the TFGO 400 mg/kg group and metformin control group. This indicated that TFGO has a certain influence of improvement on diabetic kidney tissue. In recent years, along with the increasing of the people with high life stress and high-fat diet, the incidence of diabetes is higher and higher. Diabetes is a chronic disease which is metabolism dysfunction in carbohydrate and lipids caused by the relative or absolute deficiency of insulin secretion. STZ is the common reagent inducing experimental diabetes in animals. STZ can destroy the pancreas islet β cells, then resulting in the subsequent inhibition of insulin biosynthesis and secretion. In the study, rats induced by STZ presented the classical symptoms of type 2 diabetes such as polyuria, polydipsia, polyphagia and lethargy. A 14-day treatment with the TFGO produced a significant reduction in the FBG level (P < 0.05) and improvement of the OGTT level (P < 0.01) in diabetic rats. Meanwhile, TFGO has shown beneficial effects in the body weight and food intake in diabetic rats. These actions support the TFGO have a beneficial impact on insulin deficiency and carbohydrates metabolism. Modern medical science believes that oxidative stress is closely related to the occurrence of diabetes. The oxidative stress can lead to the insulin resistance and thus promote the β cell apoptosis and inhibit the insulin secretion. MDA and SOD are the important indicators in the process of oxidative stress. The semiquinone radicals have high antioxidant activity with relatively stable chemical construction and relatively uniform electron spin density formed by flavone glycoside. This study indicates that TFGO can increase the antioxidant enzyme activity of the diabetic rats and inhibit the lipid peroxidation. Hyperlipemia is the disease of lipid metabolic disorder in the body, which can lead lipids such as cholesterol and TG abnormal increase. Metabolic dysfunction in adipose tissue can cause pro-inflammatory cytokines, which is a key factor in the production of insulin resistance. Another hand, a large number of glucose and free fatty acids in diabetic patients will invade our liver and increase the levels of TC and TG. After treatment with the TFGO for 14 days, abdominal fat coefficient, liver index, TG, and TC in the rats decreased with varying degrees. It shows that treatment with TFGO produced favorable changes in the plasma lipid profile may through alleviating the disorder cycle between lipid metabolic and insulin resistance. The free radicals released by STZ lead the accumulation of extracellular matrix proteins and cause renal tubular cell expansion and glomerular lesions. Diabetic nephropathy increases the expression of nuclear factor kappa B (NF-κB) in glomeruli and renal tubules, suggesting that NF-κB has a strong association with diabetic nephropathy. There is a beneficial impact on diabetic nephropathy by reducing the level of oxidative stress and proinflammatory expression to prevent NF-κB signaling pathway activation. After treatment with the TFGO, the morphological changes have a markedly improvement in nephro of diabetic rats. This action indicates that TFGO induce a positive influence in kidney tissue may though affecting the expression of NF-κB after reducing oxidative stress. The observations that TFGO has an antidiabetic potential suggest that it may influence energy metabolism through a circumjacent site of action. Thus, we have demonstrated that TFGO has improved the activity of antioxidant enzymes and the oxidative stress of diabetic rats due to semiquinone radicals from flavones glycoside. Moreover, it can manage carbohydrate metabolism and reduce the TC and TG level of insulin-sensitive tissues by alleviating the insufficiency of insulin, while improving the lipid peroxidation by stimulating the expression of peroxisome proliferator-activated receptor in adipose tissue. At the same time, the decrease of oxidative stress level has a certain positive influence on diabetic kidney tissue. However, further studies are required to know the exact mechanism of antidiabetic potential of TFGO. In fact, some drugs from natural sources with fewer side effects have been gradually recognized compared with the synthetic drugs., This provides an experimental evidence for the further development and utilization of okra. This study was designed to evaluate the antidiabetic potential of the total flavone glycoside from okra fruit (TFGO) in type 2 diabetic rats by determining FBG, TG, TC, liver index, OGTT and SOD levels. 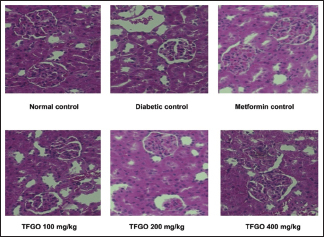 The results showed that TFGO has significant antidiabetic potential in rats, which provides a reference point for further investigation and development of TFGO. Yu Z, Yin Y, Zhao W, Wang F, Yu Y, Liu B, et al. Characterization of ACE-inhibitory peptide associated with antioxidant and anticoagulation properties. J Food Sci 2011;76:C1149-55. Yu Z, Yin Y, Zhao W, Yu Y, Liu B, Liu J, Chen F. Novel peptides derived from egg white protein inhibiting alpha-glucosidase. Food Chem 2011;129:1374-82. Taylor SI. Deconstructing Type 2 diabetes. Cell 1999;97:9-12. Maritim AC, Sanders RA, Watkins JB 3rd. Diabetes, oxidative stress, and antioxidants: A review. J Biochem Mol Toxicol 2003;17:24-38. Shroff G. Therapeutic potential of human embryonic stem cells in Type 2 diabetes mellitus. World J Sterm Cells 2016;8:223-30. Chaudhury A, Duvoor C, Reddy Dendi VS, Kraleti S, Chada A, Ravilla R, et al. Clinical review of antidiabetic drugs: Implications for Type 2 diabetes mellitus management. Front Endocrinol (Lausanne) 2017;8:6. Honoré SM, Cabrera WM, Genta SB, Sánchez SS. Protective effect of yacon leaves decoction against early nephropathy in experimental diabetic rats. Food Chem Toxicol 2012;50:1704-15. Makni M, Sefi M, Fetoui H, Garoui el M, Gargouri NK, Boudawara T, et al. Flax and pumpkin seeds mixture ameliorates diabetic nephropathy in rats. Food Chem Toxicol 2010;48:2407-12. Sefi M, Fetoui H, Soudani N, Chtourou Y, Makni M, Zeghal N, et al. Artemisia campestris leaf extract alleviates early diabetic nephropathy in rats by inhibiting protein oxidation and nitric oxide end products. Pathol Res Pract 2012;208:157-62. Chopra RN, Nayar SL, Chopra IC. Glossary of Indian Medicinal Plants. New Delhi: Council of Industrial and Scientific Research; 1956. p. 1-133. Lengsfeld C, Titgemeyer F, Faller G, Hensel A. Glycosylated compounds from okra inhibit adhesion of Helicobacter pylori to human gastric mucosa. J Agric Food Chem 2004;52:1495-503. Sabitha V, Ramachandran S, Naveen KR, Panneerselvam K. Antidiabetic and antihyperlipidemic potential of Abelmoschus esculentus (L.) moench. In streptozotocin-induced diabetic rats. J Pharm Bioallied Sci 2011;3:397-402. Liao H, Liu H, Yuan K. A new flavonol glycoside from the Abelmoschus esculentus Linn. Pharmacog Mag 2012;8:12-5. Organization for Economic Cooperation and Development Guidelines for Testing of Chemicals 423. Acute Oral Toxicity-Acute Toxic Class Method. December; 2001. Comin D, Gazarini L, Zanoni JN, Milani H, de Oliveira RM. Vitamin E improves learning performance and changes the expression of nitric oxide-producing neurons in the brains of diabetic rats. Behav Brain Res 2010;210:38-45. Xu D, Xu M, Lin L, Rao S, Wang J, Davey AK, et al. The effect of isosteviol on hyperglycemia and dyslipidemia induced by lipotoxicity in rats fed with high-fat emulsion. Life Sci 2012;90:30-8. Gu JF, Zheng ZY, Yuan JR, Zhao BJ, Wang CF, Zhang L, et al. Comparison on hypoglycemic and antioxidant activities of the fresh and dried portulaca oleracea L. In insulin-resistant hepG2 cells and streptozotocin-induced C57BL/6J diabetic mice. J Ethnopharmacol 2015;161:214-23. Moon HE, Islam N, Ahn BR, Chowdhury SS, Sohn HS, Jung HA, et al. Protein tyrosine phosphatase 1B and α-glucosidase inhibitory phlorotannins from edible brown algae, Ecklonia stolonifera and Eisenia bicyclis. Biosci Biotechnol Biochem 2011;75:1472-80. BianK, Ke Y, Kamisaki Y, Murad F. Proteomic modification by nitric oxide. Pharmacol Sci 2006;101:271-9. Sen S, Roy M, Chakraborti AS. Ameliorative effects of glycyrrhizin on streptozotocin-induced diabetes in rats. J Pharm Pharmacol 2011;63:287-96. Zhao J, Liang Y, Yan D. Structure-antioxidation relationship of flavonoid antioxidants. J North China Univ Tech 2001;13:36-44. Shao D, Bartley GE, Yokoyama W, Pan Z, Zhang H, Zhang A, et al. Plasma and hepatic cholesterol-lowering effects of tomato pomace, tomato seed oil and defatted tomato seed in hamsters fed with high-fat diets. Food Chem 2013;139:589-96. Leiherer A, Mündlein A, Drexel H. Phytochemicals and their impact on adipose tissue inflammation and diabetes. Vascul Pharmacol 2013;58:3-20. Madianov IV, Balabolkin MI, Markov DS, Markova TN. Main causes of hyperuricemia in diabetes mellitus. Ter Arkh 2000;72:55-8. Yao Y, Yang J, Wang D, Zhou F, Cai X, Lu W, et al. The aqueous extract of lycopus lucidus turcz ameliorates streptozotocin-induced diabetic renal damage via inhibiting TGF-β1 signaling pathway. Phytomedicine 2013;20:1160-7. Imig JD, Ryan MJ. Immune and inflammatory role in renal disease. Compr Physiol 2013;3:957-76. Ahmed S, Mundhe N, Borgohain M, Chowdhury L, Kwatra M, Bolshette N, et al. Diosmin modulates the NF-kB signal transduction pathways and downregulation of various oxidative stress markers in alloxan-induced diabetic nephropathy. Inflammation 2016;39:1783-97. Chiasson JL, Josse RG, Gomis R, Hanefeld M, Karasik A, Laakso M, et al. Acarbose for prevention of Type 2 diabetes mellitus: The STOP-NIDDM randomised trial. Lancet 2002;359:2072-7. Randhir R, Kown YI, Shetty K. Effect of thermal processing on phenolics, antioxidant activity and health-relevent functionality of select grain sprouts and seedling. Innovat Food Sci Emerg Technol 2008;9:355-64.